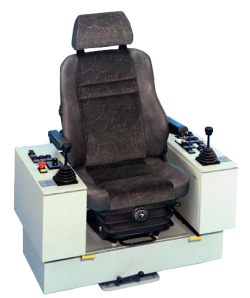 The LCS5R is an ergonomically designed swiveling crane control chair which provides a high degree of comfort. Sheet steel. The top panel of the equipment boxes with the devices can be raised and locked in position. The terminal strip is easily accessible via an opening on the inside that can be closed with a lockable cover. Comfortable spring mounted seat KFS 6, with an hydraulic vibration absorption system, weight adjustment and air-permeable artificial leather or textile material, with headrest, with arm rests. Seat horizontally and vertically. Inclination of cushion, backrest and arm rest also adjustable. Weight setting for optimum spring suspension. Sheet steel, top of which can be raised to lay cabling. The seat can be tilted backwards so that the cable duct in the cross-member is accessible. Zero-end-float spring-loaded bearing. Rotational movement 180° right, 90° left, stopped by friction brake. Anti-corrosion primer, top coat: 2 coats of epoxy-resin paint, standard colour RAL 7032 pebble-grey. textured varnish. All non-painted metal parts are electrogalvanized and chromed.